This annual QRP event usually fits in with a trip to my Parents in Dothan, Alabama. It also is a opportunity to fly with Tom WD0HBR who lives in Dothan. We do a flight to Solomon park about four blocks from my Parent's house. This year I wanted to make up for past mistakes of packing too much gear. I chose my most minimal rig the Wilderness SST-20 paired with the Hendricks SOTA Tuner feeding a half wave for 20 meters. All this fit in an over the shoulder pack but I had room left over, so I also packed the YouKits HB-1B. My new Bioenno 3 ah LiFePO4 battery worked well for a minimal pack up. There was a happy buzz on 20 meters with /BB stations. I worked 6 using the SST-20 and six more with the HB-1B. That was a dozen over the course of three hours which is my four contacts per hour hunt and pounce rate. The End Fed Half Wave did an nice job. It was curious that seven of the twelve contacts were in Colorado. I was pleased to work Shel KF0UR who is on the QRPWorks team that makes the HCT. I met him in person at the last Orlando Hamcation. 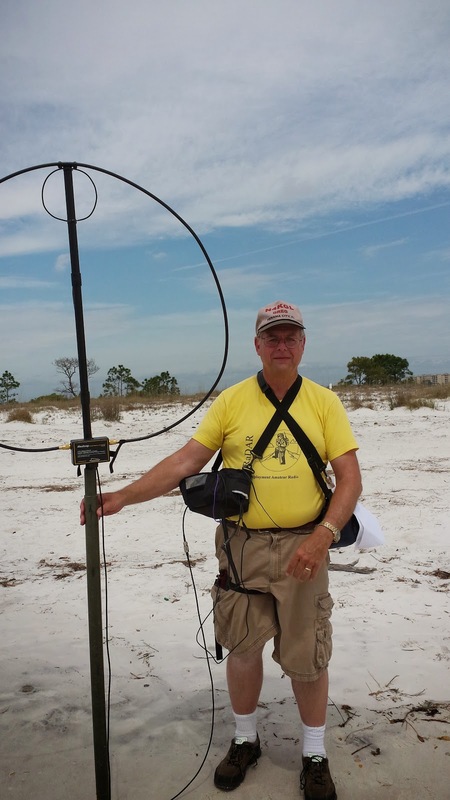 Likewise, it was great to work Myron WV0H who is a member of the Google+ RaDAR community. The weather was hot but comfortable in our shady spot. There were no showers to thwart us this year. This is a excellent QRP Portable event that I will look forward to every year. Today I participated in the Summer RaDAR Contest. The summer is pretty brutal here in Florida. It is either the Sun blazing or the rain pouring. Today we had both. Fortunately, I was able to operate from two locations. I started at a local park in Lynn Haven Florida. 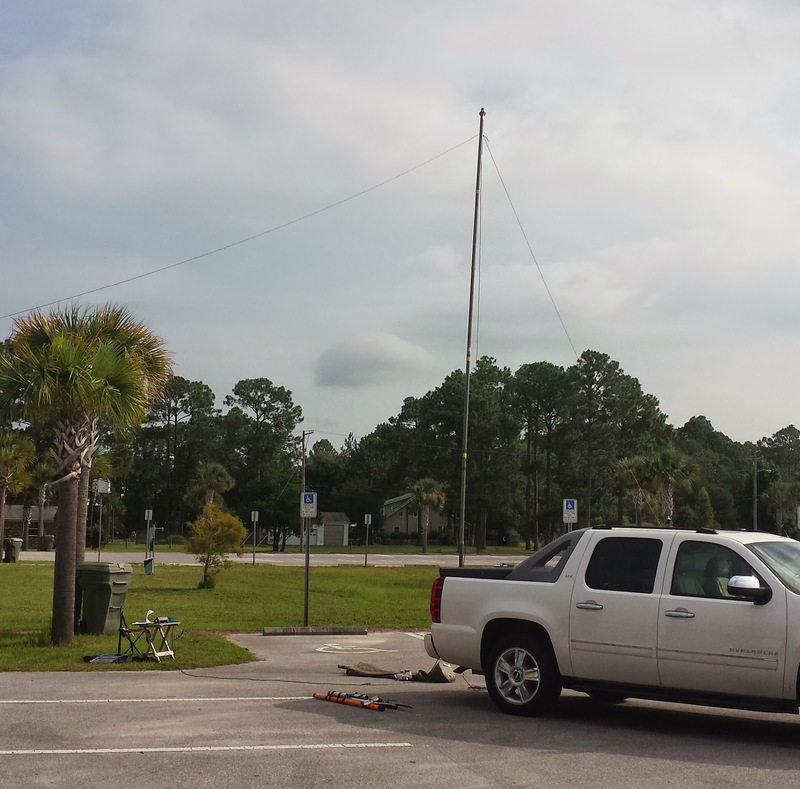 I setup parking lot portable with a 40 meter inverted vee. I was assisted by local ham Jacque KK4LUW who was interested in RaDAR. I decided to run more power than QRP due to the conditions of the bands. My first contact was WB4BLX Bob in Panama City. This was an easy contact at 10 watts CW. This was followed by WB4AQL in Chickamauga, GA. I got a call from Tom WD0HBR from Dothan, AL. It took changing to the Icom 7100 and going to 49 watts to get through that QSO. Tom was running 5 watts and a 50 foot wire. I continued working WA6VWW in TN on CW. 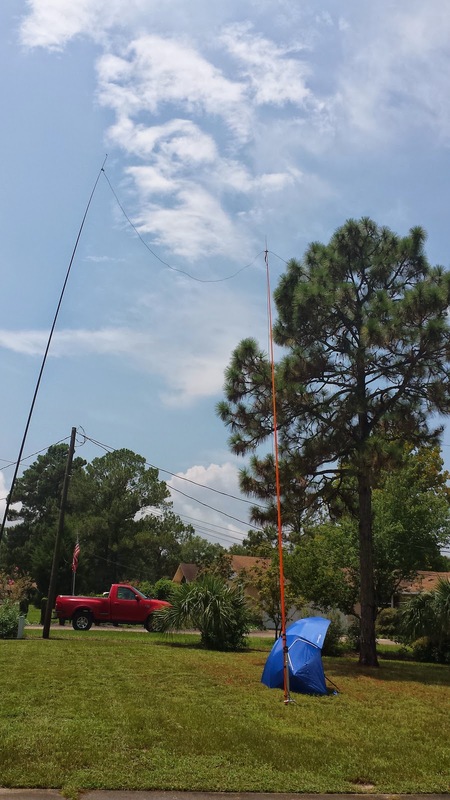 The weather was looking like rain and I found KR4HE in Youngstown, FL for a 2 meter simplex contact. Having five QSOs, I packed up and drove out as the rain started coming down. 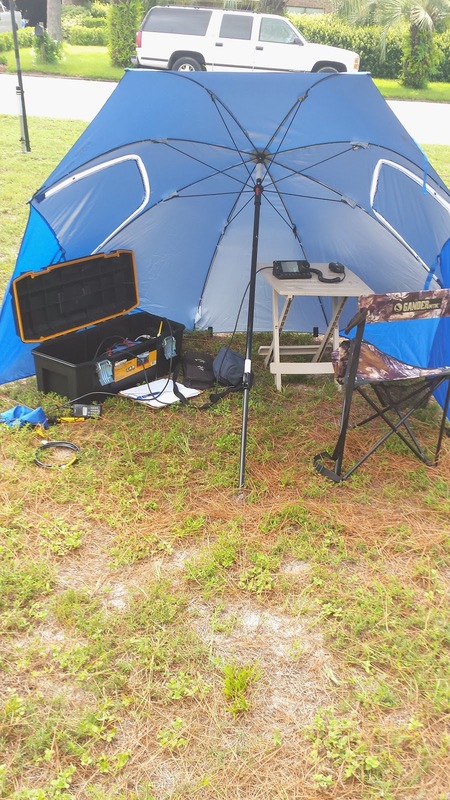 I headed toward the home QTH and decided to setup in my front yard. I went with a 20 meter dipole supported by three 31 foot poles. The blazing sun returned and I setup my superbrella for shade. Funny thing another shower came and I was able to endure it and continue operating. My first QSO in the yard was Bob KK4DIV on 20 meter SSB. He was a few miles away operating RaDAR. Next were two CW contacts KC9V and KV6Z Bill in OK. Then on 20 meter SSB I worked W1SYE who was activating Hope Island. 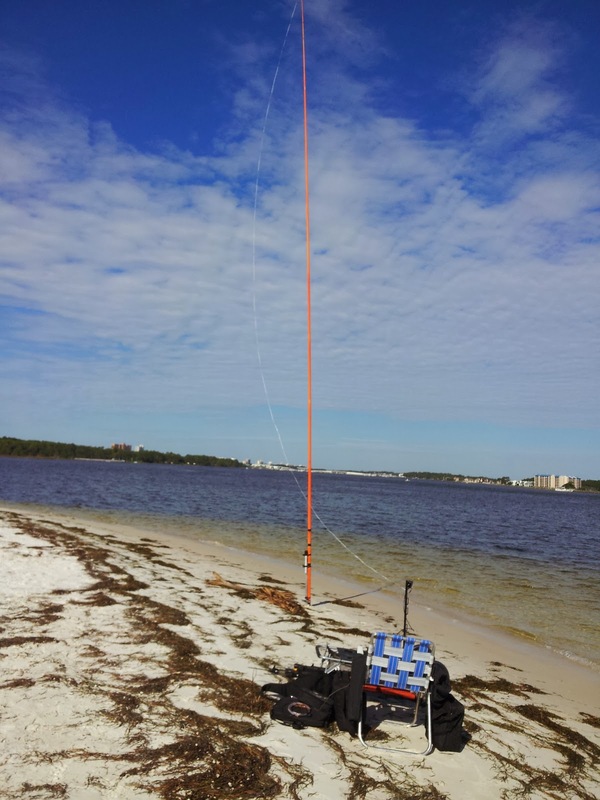 The last QSO was a by a chance contact with local K4LXA Bobby also in Panama City, FL. Summer is very taxing with the heat and the rain. I was lucky to get in ten contacts. The weight of the gear would not have worked for pedestrian mobile. My entry will be portable at the first location and vehicle mobile for the second as I drove several miles to get there. I think it was a tough day for most RaDAR ops. For us Floridians we will be looking forward to the nice November weather for the next RaDAR Contest. Also, thanks to Bob WB4BLX and Vic K4GXV for dropping by the park. RaDAR Contest Antennas: Many Choices! In April 2014, I went with the Alexloop exclusively. I only had one local 40 meter contact with it. I lost a good part of the first hour trying for more. So I will go with something more substantial on 40 meters. I have experimented with 100 and 50 foot wires using a 9 to 1 Unun in the time since the April contest. I am leaning toward using the 100 foot wire as an inverted L to start off with. The L will have a 30 foot vertical component and a 70 foot horizontal component. With 70 feet in the horizontal I suspect it will handle NVIS nicely. In fact, I had the most glowing QRP report ever with that antenna on 40. Now the higher bands could be handled by the Alexloop or a 50 foot inverted L perhaps. Certainly the Alexloop has the least setup time. So more to ponder before the July 26th RaDAR contest. Watch out I have so many choices it is easy to change my mind. Good Luck on the July 26th RaDAR Contest! The Summer (Northern Hemisphere) Rapid Deployment Amateur Radio (RaDAR)-America Contest is hereby announced - due to popular request - for July 26th, 2014 starting at 14:00 UTC and ending at 18:00 UTC. Canadian and Northern USA hams can take advantage of their summer weather. All hams in any locations are welcome to participate. Be safe! All rules from prior announcement apply as posted at this link﻿. I will be challenged by the summer heat here in Florida, but I plan to participate. I may dial it back to fixed portable or moving by vehicle rather than pedestrian mobile. The planning is a fun part of the RaDAR experience. There also will be RaDAR contests in November and October. Those are great weather dates here in Northwest Florida. RaDAR originated in South Africa headed up by Eddie ZS6BNE. It has spread to the Americas with the efforts of Marcus NX5MK. There is a growing worldwide participation. Please visit the RaDAR Community on Google+. I have been doing more reading than operating recently. I have spent a week reading Array of Light by Tom Schiller N6BT. This book is unique in correlating on-air performance with the efficiency and design of antennas. Tom does say any antenna will work but endeavors to explain how a few db can make a difference in performance and enjoyment. I recommend the book. Bear in mind much of the book is devoted to yagis. many of us are not going to have one. However, the best part of the book for me is the discussion of verticals used near or over saltwater. Tom says a vertical in that situation can be better than a yagi. The shocking thing for me is I was ready to conclude that the antenna and efficiency is not as important as some say. In other words my rate of QSOs does not seems to increase dramatically with one antenna or another or even power level. Bear in mind most of my operation is portable and my goal is just to make some QSOs. The rate of QSOs seem constant at four or five an hour. I will ragchew any chance I get. The QSO rate can be higher and it just depends on whether there are other stations out there who want to work me. For example, my best rate of QSO was 13 per hour when I operated the Peanut Sprint at one watt. There were many Georgia stations there ready to work me. So I was ready to say opportunity and conditions are significant drivers and ultimately the operator is probably the most important factor. I have heard of DXCC holders that did it with QRP and even with attic antennas. Now perhaps I have been already following some Tom's advice on antennas as my wire antennas tend to be long relative to wavelength and somewhat high. I also get them in the clear and often near saltwater. The smoking gun for me is my use of 28 gauge ribbon cable with two conductors in parallel. There is loss in the resistance there but does not seem to bite me too bad. That ribbon cable is so convenient and easy to deploy. I also use tuners and baluns I can't say what the loss they have. I think there is a mental factor to portable antennas. I started out thinking the Alexloop could not be a serious antenna. I eventually got past my mental handicap and enjoy that antenna immensely . I am blown away with 40 meter QSOs on the Alexloop where it is 15% efficient. I say be careful not to get "Blinded by Science." I will admit that I benefit often by the other station having a killer antenna. However, it seems I end up also working stations with antennas in the attic. So go figure. Fortunately, there is lots of fun to be had operating portable with antennas that are less efficient than a dipole or a yagi. I don't think this necessarily disputes Tom's argument on efficiency. Perhaps I will use that dipole with 14 gauge wire and low loss feedline more often. It just takes three supports to do it, I usually get away one or two supports or just a tripod with the Alexloop. Tom has definitely convinced me to do more with verticals near salt water. I think I will try resonant verticals near saltwater with gull wing radials. I have access to state parks on the Gulf Coast of Florida and that is just too much of an opportunity to pass up. I have enjoyed and learned much from Array of Light. Thanks for a great book Tom.